South Korea and the United States need to lift their economic sanctions on a joint project between the two Koreas and Russia, a chairman of presidential committee on northern policy said, calling for an immediate resumption of the cross-border logistic initiative Rajin-Khasan Project. 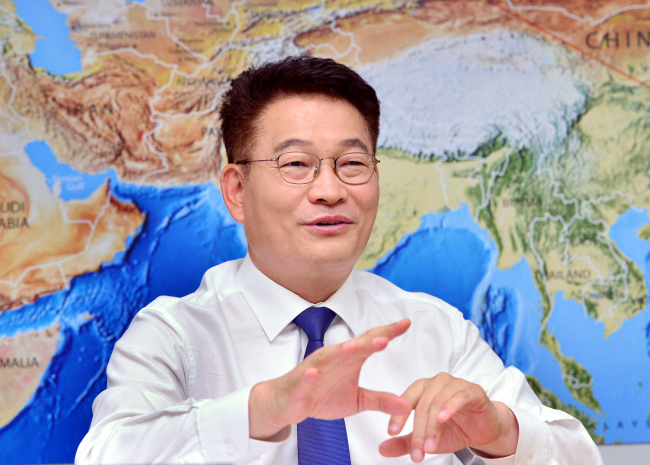 Rep. Song Young-gil, who chairs the Presidential Committee on Northern Economic Cooperation, said the two governments should allow for investment in connecting Russia and North Korea’s border towns of Rajin and Khasan with South Korea’s port cities. Song noted that resuming the Rajin-Khasan Project is easier to pursue than reopening other suspended joint projects with North Korea, as it is exempt from the UN sanction imposed on Pyongyang following its nuclear and missile test last year. The Rajin-Khasan Project is not subject to the ban on joint projects with North Korea -- a measure stipulated in the UN Security Council resolution 2375 adopted after North Korea’s sixth nuclear test last September. Russia had then protested efforts to prohibit the project. Russia has long asked for South Korea’s participation in the cross-border project as a third partner, but the bilateral negotiation came to a halt as Seoul imposed its own sanction on North Korea following its fourth nuclear test in 2016. Now, the prospect of resuming the project is being raised with the unprecedented detente between the two Koreas. Last month, South Korea’s President Moon Jae-in and his Russian counterpart Vladimir Putin pledged to continue their cooperation on energy and railways. “I don’t think it is a good idea for us to continue to keep implementing sanctions without any reward for North Korea’s pledge on denuclearization. It would raise trust issue and North Korea will procrastinate on denuclearization,” Song said. The Rajin-Khasan Project is a trilateral cooperation with North Korea and Russia on infrastructure and energy. President Moon promoted such ideas during his summit with Putin after outlining his vision to link the Trans-Siberian Railway to South Korea’s southern port city of Busan. Among the agreements following the Moon-Putin summit, cooperation in medical sectors, particularly the measure to allow South Korean doctors to operate in a certain part of Russia without a separate license, could be implemented immediately, Song said. Under the memorandum of understanding signed between Seoul National University Bundang Hospital and Moscow city government, doctors with a license from members of Organization for Economic Cooperation and Development countries can engage in medical activities in Skolkovo Innovation Center in Moscow, Song said. “It would have been an unlikely idea in South Korea, but Russia allowed it. Using OECD-approved medicine and license, South Korean doctors can treat the Russian people. We are seeking to expand it to Vladivostok and the nearby Russky Island,” Song said. Another area of cooperation involves exploring a new route for importing Russia’s natural gas produced in Yamal Peninsula. Extending roughly 700 kilometers, the peninsula is located northwest of Siberia and borders the Artic Sea. In order to better import cheaper natural gas than those from Sakhalin and deliver them all the way to South Korea, Seoul and Moscow agreed to develop a rough route in the Artic Sea, Song said. Navigating through the Artic Sea would be a tough trip. To make the trip easier, Song said the government is seeking to build a transshipment port on the Kamchatka Peninsula and more icebreaking ships. Song believes that North Korea is more eager than before for economic cooperation with South Korea, though the current international and unilateral sanctions limit full-fledged inter-Korean economic cooperation. Immediate sanctions relief should start with the resumption of cross-border economic project Kaesong Industrial Complex, which was shut down in 2016 following North Korea’s nuclear and missile tests. Song said. In order to prevent such surprise risks involved in doing business with North Korea, the Kaesong Industrial Complex should be “internationalized,” with joint investment by countries such as the US and China, Song added. “Currently, we are only talking about political negotiations with North Korea -- such as suspension of joint military exercises in return for denuclearization efforts. But what North Korea really wants is economic cooperation. They are just afraid of being embarrassed to admit it,” Song said. In Song’s view, the Kaesong Industrial Complex epitomizes great potential for economic opportunity with North Korea, which boasts more talented, cheaper workforce than any country in the world. According to Song, the North Korean workers at the Kaesong Industrial Complex were paid an average monthly salary of $84. And the land price there was almost about 1/50 of that in Seoul, cheaper than most places in South Korea. In order to lift the sanction on the complex quickly, the government needs to ensure transparency in the operation of the facility, Song said. Most importantly, it should prevent the money earned by the North Korean workers from being channeled into North Korea’s military program. Since the end of the Cold War, South Korea has sought to enhance its ties with former communist countries. Under the policy of “Nordpolitik,” the previous Roh Tae-woo administration opened up diplomatic relations with Russia and China. But the initiative -- also similarly pursued by former President Park Geun-hye – has failed to translate into comprehensive economic cooperation due to the rising tensions on the Korean Peninsula following North Korea’s nuclear and missile tests. Song believes the ongoing inter-Korean detente has brought about an unprecedented opportunity for South Korea to pursue a more active version of “Nordpolitik,” and hopes that the initiative will prevent growing competition between China, Russia versus the US from spiraling into a second Cold War. “Previous ’Nordpolitik‘ was sort of byproduct from the end of the Cold War. It was more about isolating North Korea. What we are pursuing is more a proactive initiative to embrace North Korea,” he said.